The WICA team are delighted to be supporting some very deserving charities for the 2019 Awards. Please join us and donate generously. The dedicated local staff are ending violence against women and girls and helping change lives, for good. ActionAid puts the rights of women and girls at the heart of all that we do. The local staff work alongside women and girls whose lives are held back by poverty, so they have a voice and are involved in developing solutions that fit their needs and circumstances. This way ActionAid ensures that they themselves take ownership of their own development, because at the end of the day this is the only way to bring about lasting change. There are 52.5 million girls out of school in sub-Saharan Africa. Without an education, these children are at risk of child marriage, early pregnancy and lifelong dependence on others. But education changes everything: it gives women and girls the power to make informed choices about marriage and motherhood, and to be financially independent. With access to an education women can do amazing things to lift their communities out of poverty: launch businesses, run schools, and lead governments. The Campaign for Female Education (CAMFED) works to remove the financial barriers which prevent girls from going to school. CAMFED works in partnership with girls and communities to identify the girls most at risk of dropping out of school, and provides them with a holistic support package to make sure they do not have to. 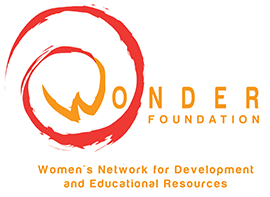 Established in 2012 as the Women’s Network for Development and Educational and Resources (WONDER), Wonder is a charity dedicated to empowering vulnerable people through education. We work with locally-led partners around the world to help women, girls and their families access the education and support they need to exit poverty, for good.